Lawsuit filed against Genoa Twp. 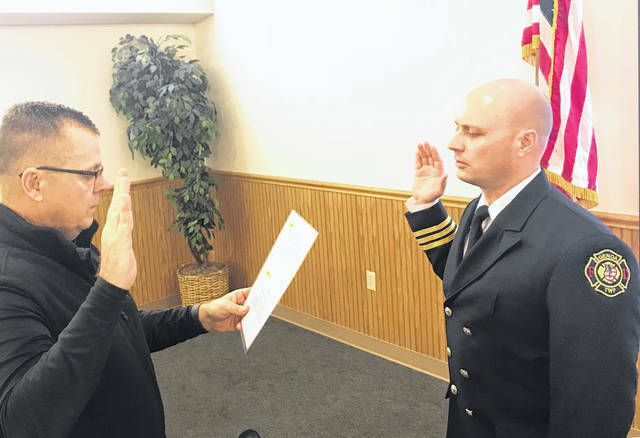 Genoa Township Fiscal Officer Patrick Myers swears in new Fire Marshal Anthony Caico. A sign for the proposed Ravines at Hoover is shown in a photo taken last fall at the site. The property owner has filed a lawsuit against Genoa Township. Word of a lawsuit against the township overshadowed the Genoa Trustees’ recent reorganization meeting, which saw the promotion of a new fire marshal and the return of one trustee from a serious illness. A lawsuit was filed in U.S. District Court for the Southern District of Ohio on the last week of December by Benton Benalcazar and Katherine Benalcazar, both of 4741 Tussic Street, Westerville. The Benalcazars allege the township has violated their rights under the Fourteenth Amendment, with counts of deprivation of property and liberty interests without due process of law; as well as unequal protection of the law; and seeks a declaratory judgment to rezone their property from Rural Residential (RR) to Planned Residential District (PRD), along with a permanent injunction and compensatory and punitive damages. “The Benalcazars spent months designing a residential development for their land that complied with every single legitimate zoning restriction on their property — not one variance or divergence was required,” states the introduction of the complaint. The couple owns 43 acres at the Tussic Street address that they sought to have developed as a subdivision called the Ravines at Hoover. They applied to rezone the property in Dec. 2017. 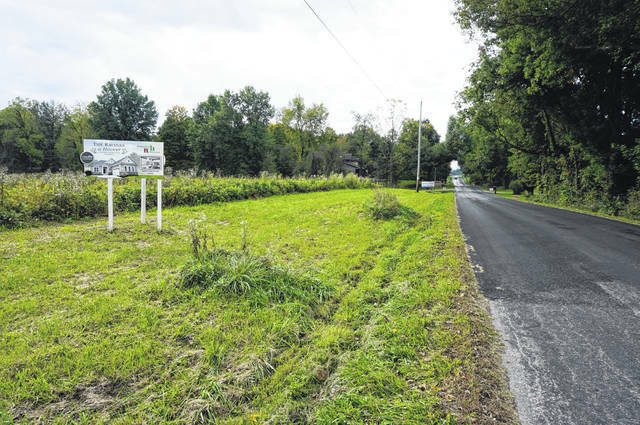 The Genoa Township Zoning Commission unanimously rejected the applicant’s plan last March. However, the trustees voted 2-1 in April to approve rezoning from Rural Residential to Planned Residential Development. Throughout the process, there was outcry from area residents during zoning and trustee meetings, that filled the township meeting room. Among their concerns was the high density housing, safety issues, and spoiling land near Hoover Reservoir and the Oxbow Road boat ramp. “The Ravines at Hoover includes only 1.89 units per net developable acre using Conservation Development Standards and therefore falls within the allowable (2.2 units) density for the PRD,” states the complaint. In addition, the plaintiffs stated in their complaint that their use of a centralized sanitary sewer system for the housing development was safer for a watershed used by the City of Columbus than in using separate septic systems on the 8 parcels. Further, they allege that rezoning would result in one entrance to the subdivision, as opposed to six separate driveways. Frank Dantonio, the sole trustee to vote no on the rezoning, encouraged community members to seek a referendum to return the property to RR in an email dated April 16, 2018, the complaint alleges. Area residents did receive enough signatures on a petition to put the issue on the ballot. In the November primary, the zoning referendum was defeated by a whopping 3-1 margin, 10,304 (76.5 percent) voting no to 3,159 (23.5 percent) voting yes, with 13,463 total votes. If one had driven through the township prior to the vote and seen the high number of signs both in favor of and opposed to the issue, one might have thought the results would have been much closer. At the time, Mr. Benalcazar said he was surprised at the results and considering what to do next. During the comments portion of the Jan. 3 township trustee meeting, Dantonio brought up the lawsuit, and said there were misstatements by the plaintiffs. He did not elaborate, and the meeting proceeded. In addition to assigning themselves to different committees and adopting policies, the trustees also approved the acquisition of a ballistic shield for the police department to use in active shooter situations. Chief Steve Gammill said the $2,900 shield would essentially be purchased with federal drug seizure money because Genoa is part of a multi-agency tactical unit. The meeting also saw the return of trustee Connie Goodman, who had been gone for a month. She said that people initially thought she had suffered a stroke; but it turned out to be Guillain-Barre syndrome, a neurological disorder where the immune system attacks the nerves, causing paralysis. Goodman said she would make a full recovery but needed to use a wheelchair for the time being. She thanked the trustees and public for their support and well wishes, as well as Riverside Hospital and Ohio Health for their treatment. Trustee Karl Gebhardt said there would be an annual “State of the Township” address, along with the resolution of a dump truck lease with the maintenance department, in subsequent meetings.